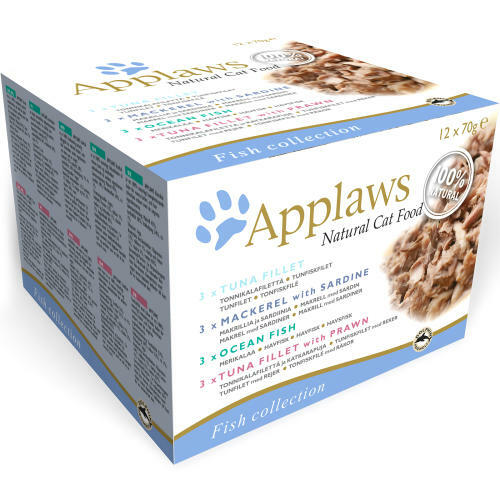 Applaws Fish Deluxe is a tasty selection of complementary adult cat food recipes, made with no more than four completely natural ingredients each. Made with select fillets of freshly sea caught, dolphin friendly mackerel and/or tuna, cooked in their own savoury broth and served with delicious prawns or seaweed or wholesome rice, each recipe is completely free of animal derivatives and artificial additives of any kind. With Ocean Fish, Tuna Fillet, Tuna Fillet with Prawn, and Mackerel with Sardine recipes to choose from, -all naturally loaded with Omega 3 and 6 fatty acids for a soft, silky coat - Applaws Natural Cat Food is the perfect way to treat your feline friend every day. Tuna Fillet (Tuna fillet 75%, Rice 6%, Fish broth 19%); Mackerel with Sardine (Mackerel 70%, Sardine 5%, Fish broth 24%, Rice 1%); Ocean Fish (Mackerel 45%, Tuna fillet 30%, Rice 1%, Fish broth 24%); Tuna with Prawn (Tuna fillet 52%, Fish broth 24%, Prawn 23%, Rice 1%).